Question: This season was difficult and I just don’t know if I have the ability I once did to keep winning. I made some changes in my life during the past year and I have begun to wonder if I really have the necessary talent to make it where I want to go. How can I find that spark to get back on track? Answer: To paraphrase an old quote, “What would we accomplish if we knew we could not fail“. In every competition in every sport, there are the favorites: the players or teams that have accomplished more and have overcome adversity to win. However, there is always the individual that refuses to accept defeat or even believe that defeat is a possibility. People will talk and say you’re not good enough or good as you were. This plants a seed of doubt that can grow into more unless you really believe in yourself. Never, ever allow anyone else to write your obituary. The pundits and point spreads don’t really matter. David really did defeat Goliath, and in many sports on many occasions the underdog has emerged the victor because he/she refused to believe the hype surrounding the favorite. How you handle the fear that creeps in during the too quiet moment is what makes the difference. The University of Georgia Women’s Gymnastics teams won ten NCAA National Championships, seven of them with Suzanne Yoculan as the head coach. She preached to all of her athletes that fear is a result of a lack of preparation. 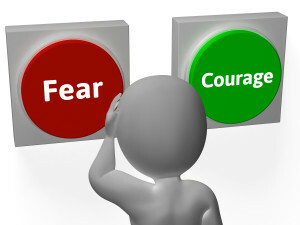 Fear can take root when you don’t believe in your training, your coach, your team or usually yourself. For you, somewhere, you stopped believing you are great, stopped believing you are who God made you to be (Job 10:8 – Your hands have made me and fashioned me) and started believing the lie that you just weren’t quite good enough. Confidence is the game changer and it can be restored with one small victory at a time. Take one step to get uncomfortable in your training, not uncomfortable with your training. You’ll see positive changes and little by little your confidence will return and won’t be shaken. If you’re not doing as well as you want to be doing, or even doing as well as you once were, then look at your training, look at your food, look at how much rest you’re getting, look at your water consumption and even look at your stress levels and the levels of stress that get projected on you by your friends and living environment. Find the points that need to be addressed and make changes even if they are difficult ones. If you were better training differently, muster the courage and respectfully address the situation with your coach. Make changes to fulfill your dreams and goals. It’s your life to live and no one else has the right to determine your outcome if you put in the work and are willing to sacrifice to get where you want to be. Becoming a champion is never easy or simple but it is worth the sacrifice. If you’re willing to give up who you are for who you want to be, then you can move forward and be who you want to be, doing what you want to do.